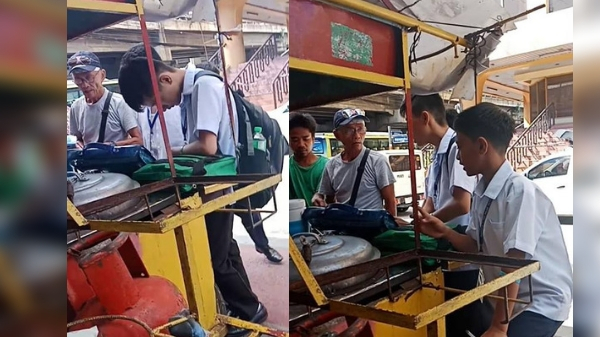 MANILA, Philippines – A video showing a vendor earnestly teaching a group of students after school has gone viral recently. Elementary students flock to this vendor after school not to eat but to learn English! The unnamed vendor can be heard giving instructions and English words for the students to spell. Using the vendor’s cart as a table, the elementary students huddled together as they spelled out words such as “radish, recommend, headache, excellent.” The vendor can also be seen explaining what the English words mean. Faigmani explained, “Ang scoop ng aking video ay spelling test sa mga bata kung saan masusing binabaybay pa ito ng kanilang 'sidewalk vendor teacher' para mas makuha ng mga 'estudyante' ang tamang spelling." The impressed netizen said that he even witnessed how the vendor provided papers and pencils to his “students” for their exam. According to Faigmani, what’s more impressive with the vendor is that he is a true “survivor.” He shared that the vendor lost his parents and grew up as an orphan so he missed the opportunity to finish school. Faigmani added that the vendor survived a fire a few years ago that destroyed his property. Things should have gone a bit better after the vendor attended a seminar in University of the Philippines for educators but he lost the certificates in the fire. Netizens couldn’t help but be impressed at how the vendor took the time to teach the students. Some also pointed out that the vendor didn’t even force the students to buy any of his goods. In a short interview, Faigmani told The Summit Express that he went back to talk to the vendor after the video has gone viral. Unfortunately, he said that the vendor was no longer there because the Metropolitan Manila Development Authority (MMDA ) allegedly confiscated his goods. “Sana po ay maging inspirasyon ito sa mga may sobrang oras at resources, share po tayo ng kahit konting regalo at blessings,” Faigman added.